Map of the besieged castle during the Shimabara rebellion. Remains of Hara castle, as seen from the ocean. Hara Castle (原城, Hara-jō) was a Japanese castle in Hizen Province (today in Minamishimabara, Nagasaki). 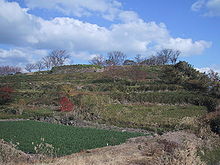 During the Shimabara Rebellion (1637–1638), rebellious peasants were besieged there. As a result of the Shimabara Rebellion in 1637, the Shogunate decided to expel the Portuguese from Japan. The Dutch, meanwhile, gained the trust of the authorities after they bombarded Hara Castle, where the insurgents had taken refuge, and thus gained a monopoly on European trade with Japan. Wikimedia Commons has media related to Hara Castle. This page was last edited on 8 April 2015, at 17:41 (UTC).